Want a taste of spring in the dead of winter? 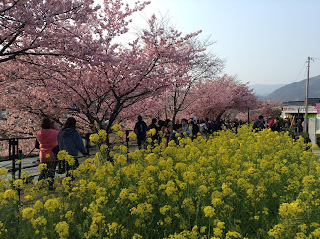 How about some early blooming variety of sakura in Kawazu in Izu? We came at the end of February and because 2016 is warmer, the cherry blossoms have been in full bloom for about 5 days, much earlier than last year - it's still mostly pink despite some leaves coming out. The official website (河津桜まつり) has daily photo updates of the progress. 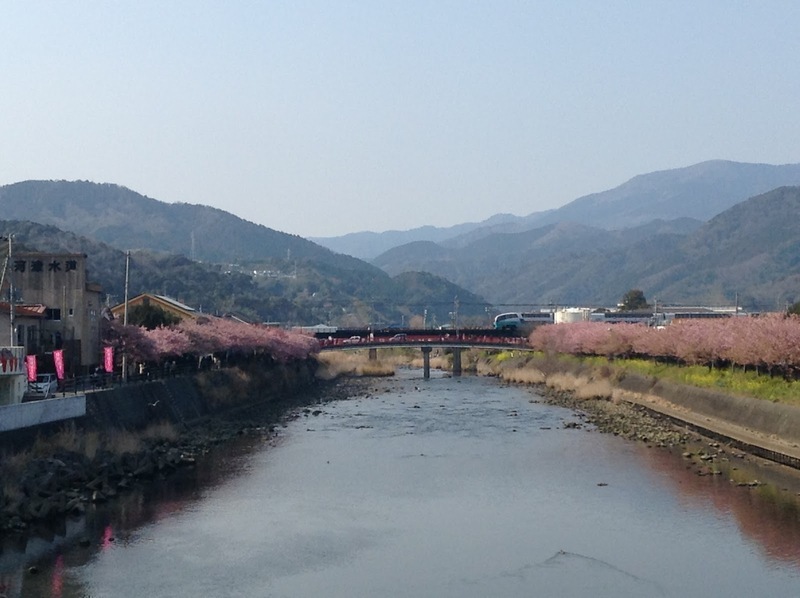 Even though it's not really as magical as the advertising posters, it's a couple of kilometers of cherry blossom trees lining the river, with many street vendors on the side closer to the station. The long stretch between Kinomiya Bridge [來宮橋] and Mine Small Bridge [峰小橋] has sakura on both sides of the river, so does a smaller stretch close to the coast (left side of the train tracks / south of the station). It's crowded on the weekend but nowhere as congested as many famous sakura spots in Tokyo. Because the river is wide, it's not as impressive as Meguro River and the sakura is a brighter shade of pink instead of pale pink but still quite nice, especially when it's lit up at night from 6-9 pm near the coast. Another small stretch up the river is also lit up. Most vendors are closed at night, with the exception of a few food stalls. We stayed for one night at Yakushi no Yu 薬師の湯. After exiting Kawazu Station, cross the street and walk towards the river. Turn right up the river and cross Arakura Bridge [荒倉橋] then walk 10 more minutes - follow the signs in kanji straight, then right, then left slightly uphill. It's in a nice quiet residential area - a pleasant walk although quite dark at night. The room is decent and clean with an ensuite toilet and sink. The rooms are not soundproof so noises from other guests and infrequent trains can be heard but it's fairly peaceful otherwise. The fridge can get a little loud but it's not too bad. The gender separated public indoor hot spring bath is a little dated but pretty standard even though the shower's water pressure is a bit weak. The outdoor one has plants around it and stars can been seen at night so it's quite pleasant. 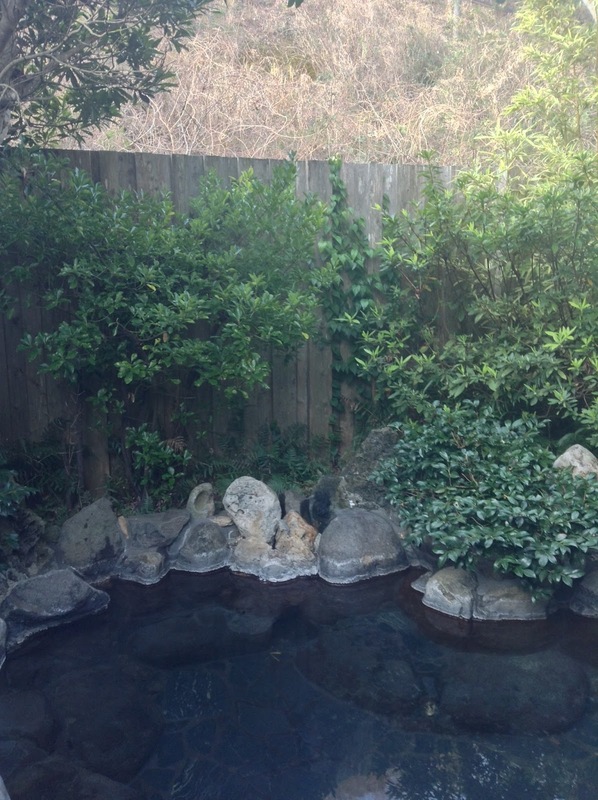 I think there's also a private outdoor onsen that costs extra. We didn't use the pool that's open 'til 6 pm but can see it from the room. The water feels lukewarm but probably still too cold to swim in February. We didn't get a plan with meals but there are a few restaurants and convenience stores near the station. No wifi. The next day we headed to Atagawa for some strawberry-picking fun! There are a few places, but we went with Ichigo Land Nakanishi いちごらんど中西. From Izu Atagawa Station [伊豆熱川駅] call them at 0557-23-0187 for them to send a free shuttle to pick you up. The lady on the phone could speak some English. It took them 10 minutes to come and pick us up outside the station. It's a 5-minute drive up a very windy and steep road. We were glad we didn't just walk it. 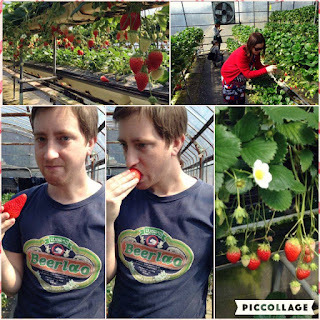 We paid 1600 yen for 30-minute all-you-can-eat strawberry-picking which includes a small plastic tray with a bit of sweetened condensed milk that goes very nicely with the strawberries. Prices vary depending on the time of the year. Their website (in Japanese) has all the info. There were loads of very nice strawberries and it’s not too crowded even on a weekend (probably busier than usual because the Kawazu cherry blossoms are in full bloom). 30 minutes is definitely enough time to eat all the strawberries you could possibly eat. Given how expensive strawberries are in Japan, I think it’s well worth it.